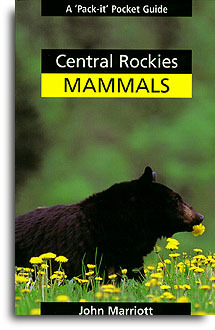 Wildlife photographer John Marriott introduces you to 38 different species of Rocky Mountain wildlife in his first book, Central Rockies Mammals. This pocket guidebook features over 70 superb full-colour photographs and lively, thorough descriptions of each mammal, from the majestic grizzly bear to the tiny pika. The author relates many of his own experiences with these animals, lending a personal touch to this easy-to-read, non-technical guide.